Argon plasma was generated using an atmospheric pressure plasma jet system to sputter silver ions for mullite coating. Optical emission spectroscopy (OES) was used to determine the dominant species in the plasma together with the calculation of electron temperature at 1.6873 eV, verifying the generation of cold plasma. X-Ray Fluorescence (XRF) result reveals the presence of silver particles in the treated ceramic sample. Using this sample, rainwater was filtered for bacterial testing confirming initial probable antibacterial activity. The heterotrophic plate count (HPC) of the rainwater filtered with the treated ceramic was lessened up to 51% compared to the control sample. A. J. Deang, G. Malapit, and I. Culaba. 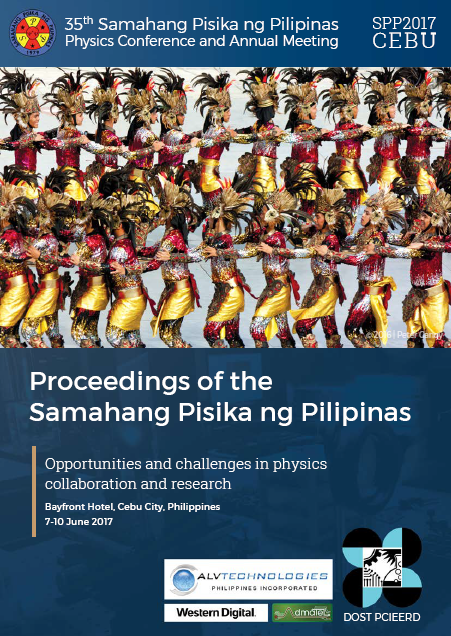 Implantation of silver particles in porous ceramic via atmospheric pressure plasma jet system for the antimicrobial treatment of rainwater, Proceedings of the Samahang Pisika ng Pilipinas 35, SPP-2017-2D-05 (2017). URL: https://paperview.spp-online.org/proceedings/article/view/160.